I have always been the type that wanted to just do his job and be left alone. That was easy at Sea. From the time I served six years in the Navy I was on independent duty. On most of the ships I reported directly to the executive officer. Do your job and you are a hero. Foul up and you are an idiot. I always liked that. Shore duty was loaded with Doctors, Nurses, and Egos. No chance to just do your job with few exceptions. I am not really speaking badly of the Navy, this is organizational dynamics. This patch represents that exception in my career. 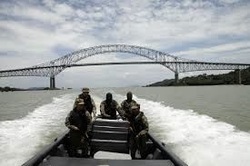 It is the Naval Communication Station located next to the little Canal Zone town of Balboa. The had a job for one corpsman and from 1972 until 1976 that corpsman was me. Pretty tough to read but I will make it as easy to understand as possible. One thing for you to get used to right away is that it's different. Coco Solo is at the upper left of the map. That is the Atlantic port. Gorgas Hospital is in the lower right. That is the Pacific port. This is one place where the Atlantic is west of the Pacific. Family members can disregard this paragraph as you have heard it (many times, I am told). We once had a bike ride from Coco Solo to Balboa. I won more than a couple beers convincing folks that I had ridden basically east to go from the Atlantic to the Pacific and crossed the continent in one day. 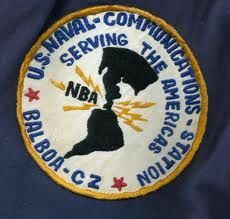 The Naval Communications Station (Comsta/NCS) had three major sites and two of them were separate by necessity. 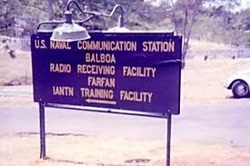 I think the headquarters building (red patch under Curundu and Gorgas Hospital) could have been anywhere but the transmitter and receivers facilities had to be separate. To understand, as it was explained to me: If you stick your head and a bullhorn inside a barrel and shout things will not be good. You will blow your eardrums. Their electronic eardrums were more expensive than yours. You can see the road running through the zone adjacent to the Pacific Ocean. This bridge (according to google) crosses the canal there. The bridge was dangerous and we lost one sailor (a young storekeeper) who piled up his Motoguzzi bike while crossing it. My understanding is that as tall as it seemed to be the carriers could not all sail under it. Removing masts or going around the horn were their options. After being stationed here for about a year, this peaceful looking headquarters building became where I worked when I was in the office. You can see the roof peeking out from the left side of the picture. It is a walkway from my office to the main building. The Executive Officer kicked some folks out and put me there when it became obvious that there was a problem. The little cubby hole I was in (second floor right in the middle of those four trees) left no room for privacy. People discussed a bunch of things with the corpsman and there was a very busy office next to my first office. Downstairs and across the driveway was much better. 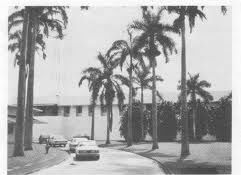 To the right of this picture were the Eleventh Naval District offices. There was a Captain Palumbo who was a doctor and another Chief Corpsman. On paper the other corpsman somehow coordinated my activities but my xo was my only boss. I guess it was necessary to justify a position. I liked the guy but resented this nonsense. I never saw any of them except for some scheduled meetings. We would be asked if we had any problems and the answer was always no. If I had one I took it to my boss. There was another corpsman at Gorgas Hospital and I did deal with him when I had people hospitalized. That headquarters building looks calm from the outside. It isn't. Behind that peaceful facade was bedlam. 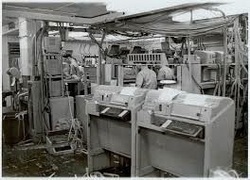 It didn't seem to be bedlam to the radiomen and electronics techs but it was to me. When I first came here this was where I held sick call because I was berthed and officed at the transmitter some 20 miles distant. On the map it is directly under semaphore hill. This is how we dealt with that. I was given this 1964 International scout and a key to the gas pump. I had just spent a few years treating 80 some guys out of a small locker. Now I got to treat about 300-400 out of a small container. I found this vehicle to be perfect. Sometimes I needed to travel to a fairly remote spot to treat someone. I never felt I couldn't make the trip. Far superior to the Postal Jeep I drove on Guam. Some of the individual stations on a site might not be believed without seeing them. Google images good for that because nobody seems to have posted the pictures. This took the place of the sick bay locker on the subs. 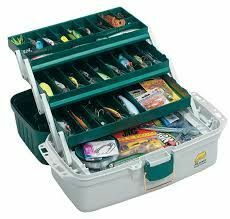 It was just what it looked like, a fishing tackle box. I put medicine in it and traveled to the headquarters and receivers facilities to hold sick call. Some things required a doctor and many things require more than you can do under these primitive circumstances. For those things we had this. 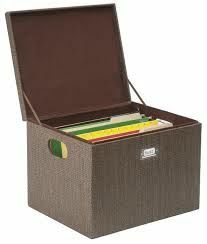 In a box like this and then a bigger one that could carry folders with consult sheets, spectacle order forms, and the various other forms one might need along with the medicine. The stuff I carried kept growing. My xo decided that the tail was wagging the dog and moved me to headquarters. Eventually I had a facility as good as what I started with and it was closer to the action. 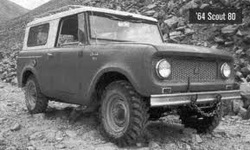 The stuff I carried started shrinking but the International Scout kept on trucking for four long years of probably 60 miles per day. This place was where the barracks were. 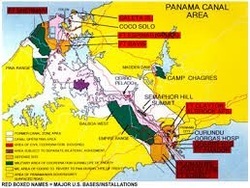 When I first went there the NCS was an all male active duty force. Civilian women employees of course but they really were seldom my problem.. I think it was 1973 that the first active duty women came and that meant trouble for me. I had to ask that when one came to sick call that she was accompanied by a female companion. Things went pretty smoothly. The building on the left is a typical barracks although it was typical of buildings that had other uses as well. There were window unit air conditioners in the rooms but I thought it was comfortable with the windows open and a good breeze. I got outvoted by my roommate in this case. His name was Joe Weavel and the last I heard he had become a constable in Talequa, Ok. He was pretty junior which is like drawing the short straw. When I heard that I agreed to having an AC. 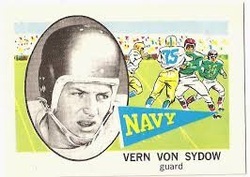 My second XO was named Vernon Von Sydow. I understand that he is a cousin of Max. For the sake of simplicity I will refer to him as XO or Commander. He said his claim to fame was that he played with Heisman Trophy winner Joe Bellino during his freshman year. Then as a senior he played with another Heisman Trophy winner named Roger Staubach. I have no idea if either won it the years they played together. I played intermural football against him and tried real hard but always felt as though he was holding something back. Still think so. I think his claim to fame really is that he was a superb Naval Officer. He allowed a person to do his job until he proved he couldn't be trusted. I thought he was in real estate in San Diego after he retired. As it turns out he found his way into education and was recognized for a long history of accomplishments not long ago. Curiously I spent a time in real estate and found I did not like it and had little knack for it. We seemed to follow the same paths but, not surprisingly, he followed it better. Just a little note on the international. For you gearheads, it was a 152 cid slant four. IHC had no small engines so they took one bank of cylinders from their 304 V8. I'm sure this picture is not stock but they did run pretty good. Strong point was the torque. I thought it broke a lot but it could have been the mechanical benign neglect it lived under. Over the long haul this was the only shore duty station I really liked. Learning to speak vietnamese at the Defense Language Institute was fun and recovering Apollo 14 from the Pacific area around American Somoa was fun. I would have preferred being on a ship to either of these. Until I became a special ed teacher being a corpsman was tops. Being a Navy Hospital Corpsman on independent duty at sea was a really great experience.